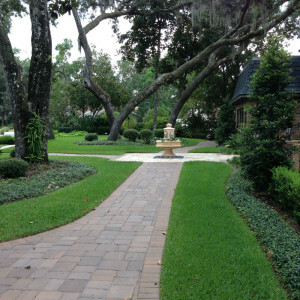 Lawn Services: (407) 473-3080Call Today for a Free Quote! Bio Green Natural and Bio-based fertilizer are safe for your pets and family, are environmentally responsible, and are also lake and river-friendly. Bio Green Natural Fertilizing Services will make your lawn, trees and shrubs green, healthy and beautiful in an environmentally safe manner. 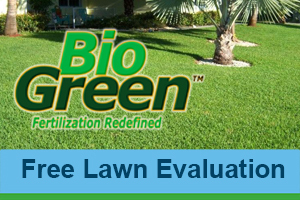 Professional applications are applied by licensed and insured local lawn care Bio Green Service Technicians. Bio Green Service Providers utilize the line of Bio Green USA Inc.’s soil amending fertilizers. These patent-pending natural fertilizers were created and are manufactured exclusively by Bio Green USA, Inc. They are simply the best and the most environmentally responsible fertilizers available in lawn care today. Bio Green fertilizers are non-toxic and designed to feed your turf, trees, shrubs, and flowers as well as stimulate soil activity which builds sustainability and overall fertility. Just like your lawn, proper nutrition is essential for your trees. Resistance to drought, disease and severe weather are significantly increased if your tree is healthy and strong. Our service professionals apply Bio Green Complete Landscape Nutrition™ directly onto the trunk of the tree, covering the bark of the tree thoroughly. This allows the tree to absorb essential nutrients immediately. For younger trees the spray will be a bit lighter. Typically a few applications will generate amazing results on any tree, regardless of the size, age or species. In colder climates where the tree enters into a dormant period and can even freeze solid, an early spring application is needed to help jump start your trees growth for the season ahead. While the fall application helps your tree store energy and nutrition for the cold winter months. In warmer climates, it is essential to provide the tree with all the essential nutrients throughout the year. Your Bio Green service professional will determine the necessary nutritional recommendations for your area. Your shrubs need nutrition too! Feeding them Bio Green’s Complete Landscape Nutrition™ along with your lawn and trees will provide the proper nutrition for your entire landscape. Providing the proper nutrients to your shrubs on a regular schedule will result in dense and full shrubs. Interested in having Bio Green applied to your landscape? Locate us! You can also call us at (407) 378-7971.